At Agrobank, our mission is to provide a holistic range of financial services and banking facilities with a focus on the agricultural sector.We dedicate our priority to the needs of our customers by providing attractive products and services such as savings activities, banking services, takaful, financing and advisory services. 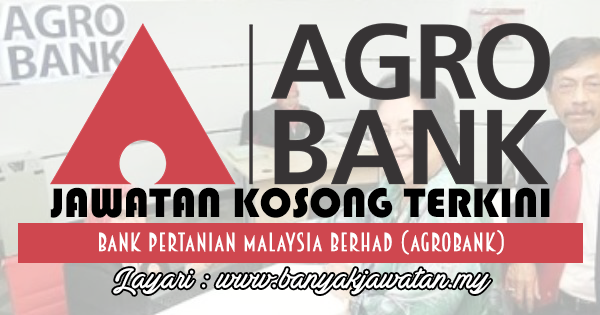 Agrobank is a continuity of the former Bank Pertanian Malaysia which has 40 years of experience in agricultural banking and an excellent track record in shaping and developing successful entrepreneurs. With a wide network of branches throughout Malaysia, we are confident of providing the best services to all. 0 Response to "Jawatan Kosong di Bank Pertanian Malaysia Berhad (Agrobank) - 30 August 2017"